Simon Wren-Lewis takes a look back to the 60s and 70s…”The reason I write about this now is that I’m in the process of finishing a paper on the knowledge transmission mechanism and the 2010 switch to austerity, and I wanted to look back at previous macroeconomic crises.” Robert Waldmann is part of this post. Update: some guy named Krugman suggests that I am not totally off base here. The Disappearing Entitlements Crisis I hear he has an audience. 2009: Medicare Unsustainable. From less than 4% of GDP heading straight for 11%. Why is JEB still having the same conversation about viability of the program? Ten years ago I would have earnestly told you that we didn’t have an ‘Entitlements Crisis’, we had a ‘Health Care Crisis’ that was reflected in the Medicare numbers. Today? I am not seeing ‘Crisis’ at all. And certainly no ‘Crowding Out’, no ‘Intergenerational Warfare’. 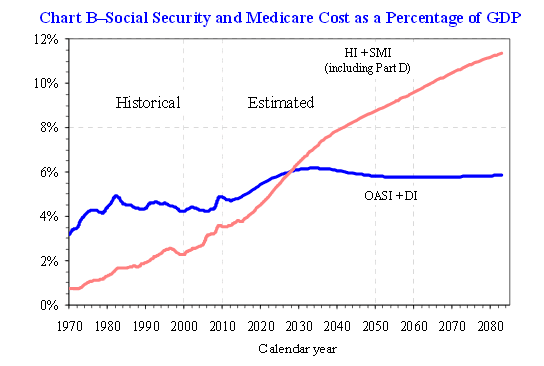 The Social Security and Medicare population are projected to increase from around 16% of the population now to 25% in the next few decades. And the amount of GDP we will need to devote to their income and medical care will go up proportionally. What’s the alternative? Starving gramma and denying her pills? 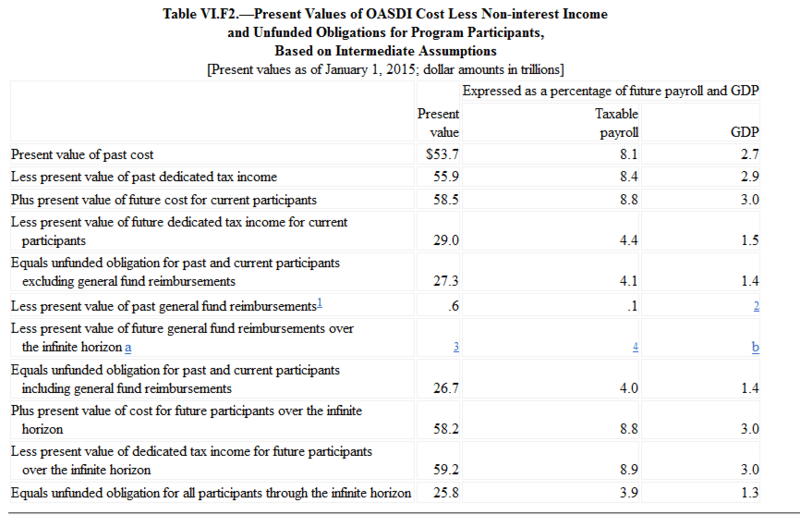 Lots of numbers here but the only ones want to focus on are those in the last column, those which show actuarial balances for each of the OAS and DI Trust Funds for for the next 25, 50 and 75 years for each of the Low, Intermediate and High Cost Alternatives. The first thing I want to note is how front loaded the crisis is for DI. Under current projections its Trust Fund will go dry in the 4th quarter of 2016. On the other hand the total fix for the period 2015-2040 is only 0.30% of payroll. Which is almost identical to the cost of the fix for the whole 75 year window or 2015-2090. Meaning this isn’t a case of a patch that needs to be revisited a couple decades out. 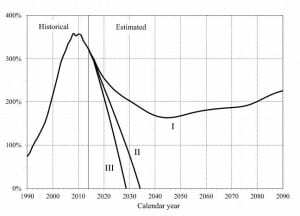 We could if we wished fix DI for 2016 and 2040 and 2090 right now for a very modest cost. 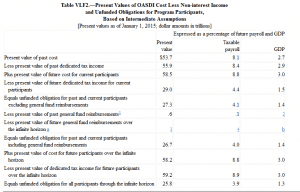 Moreover such a standalone fix would meet the requirement the Congress stuck into the budget rule, that any fix for DI would have to positively effect the overall prospect for combined OASDI. While this requirement was inserted in hopes of Obama and the Dems being forced to open up the entire program for discussion and ‘reform’ there is actually no reason NOT to piece-meal it. Fix Social Security DI by a one time increase in FICA of 0.31% of payroll and we have bought more than a decade of space to address OAS. Another way to look at this is as a down-payment on the Northwest Plan. Once people see how cheap and easy a DI fix was making them understand that a series of increases even smaller than that starting 3 or 5 years down the road might be the optimal choice. Or at least as the opening point for negotiations on the right mix of revenue enhancements. In the meantime: DI Fixed. Done. For as Far As the Eye Can See. Let’s get started? Hmmm. I think I’ll just let people have fun figuring out what this all means. Hover over the image or double click and you should get legible version. Hint the meanings of ‘past’ ‘current’ and so ‘future participants’ might not mean exactly what they seem at first encounter. You can scroll to the text from this attached link to the Figure. Well one answer it line I in the above figure from the 2015 Social Security Report. 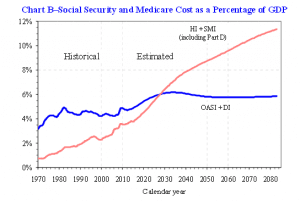 Under the definitions used by the Social Security Actuary and Trustees the program is ‘Solvent’ over the short term if it never gets within 10 years of dipping under the 100% line in this figure, ‘Solvent’ over the long term if it never hits that 100% line in the 75 year actuarial window and ‘Sustainably solvent’ if the line is trending upwards as it leaves that window. Under this year’s Low Cost Alternative it would meet all those tests. Now there are two ways to look at “Low Cost”. One is as a combination of economic and demographic numbers that are together riding the outer edge of the probability band. Which is to say a combination that if current policy remains unchanged will have maybe a 5% chance of occurring. From that perspective it is just Pie in the Sky optimism. The second though is to see its OUTCOME as a target and to use the various components of Low Cost to show us where to focus our attentions. For example if we hold demography steady would improvements in Real Wage Differential and Productivity move us closer to Solvency? Well we just need to inspect the relevant Table. 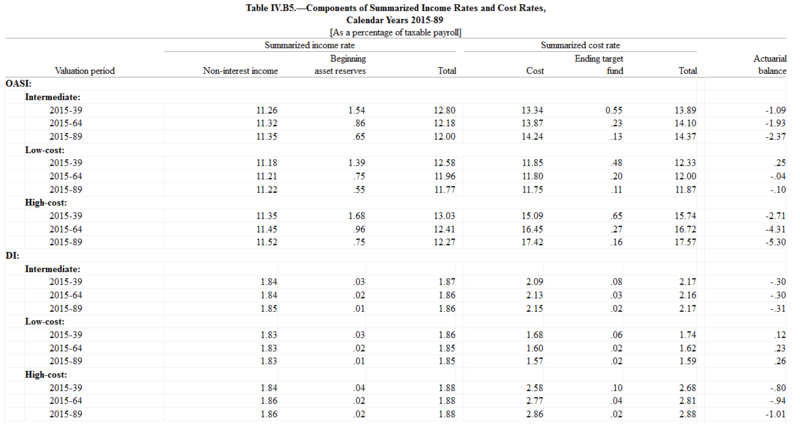 In this case Table V.B1.—Principal Economic Assumptions And the first order answer is “Yes, improvements in those two metrics improve solvency, move us closer to the desired outcome”. 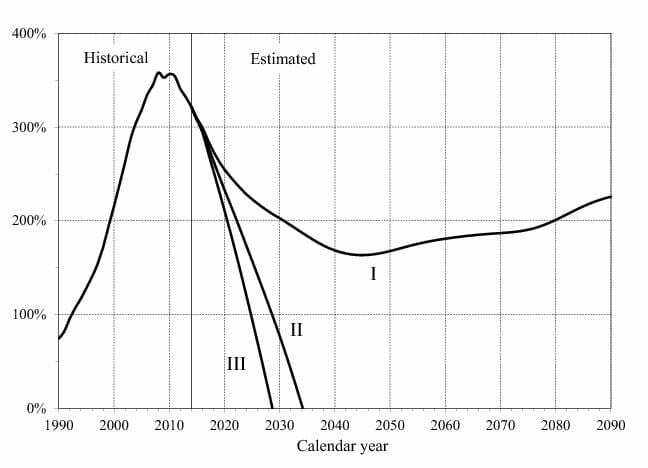 Now the second order answer might be “But the specific projections are still too optimistic, maybe we can move in the direction of Low Cost, but not get all the way there”. Which doesn’t mean just dismissing Low Cost, instead accepting that it gives us policy guideposts “Go THAT way!”. And why not? So what if the realm of the possible puts limits on our reach? If getting halfway to the goal via this path does good things for Social Security and good things for the economy at large why shouldn’t we use them as deliberate targets for active policy? In future posts I will put us some specific projections of Low Cost and ask why they are out of reach. Note I will not be asking why the entire combination of projections is feasible. Because Low Cost is an artificial model that assumes that a lot of things break in a positive way, not all of which may be realistic. Which doesn’t subtract from the reality that if we can move 6 of 10 variable in that positive direction then positive effects are seen. Once the Report is released this post will be updated with key numbers, dates and talking points. I will also be working with the text of the Report to transform it into more readily accessible form as an Excel Workbook with associated .jpgs and .pngs of the more important Tables and Figures. More on that as we go along. Right now that current Report shows as the 2014. This should update to 2015 immediately on release and so this is probably the best link to be clicking on in the meantime. At least it will get you somewhere other than dreaded Room 404. Back with more when there is more. Update 1 Report not out online but Treasury Press release has Trust Fund Depletion in 2034 and 75 year actuarial gap at 2.68 or down from 2.88. Reasonably good news but the devil is in the details which are still forthcoming. Update 2 HTML version online under first URL cited above. 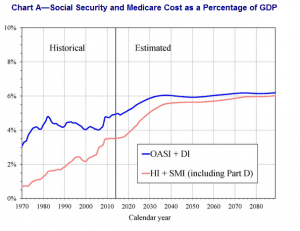 CRS: Social Security: What Would Happen If the Trust Funds Ran Out? Very interesting paper that I missed in real time. Almost everyone who addresses this question assumes that the answer is pretty simple: if either of the Social Security Trust Funds goes to zero than benefits will automatically drop from ‘Scheduled’ to ‘Payable’ which translates to a 22-25% overnight cut depending on which Trust Fund we are talking about. But I had an interesting conversation with Andrew Biggs some years back. Andrew is a very prominent advocate of Social Security ‘reform’ which he sells on the basis that the system is ‘unsustainable’. As such he and I and Coberly and he have had some vigorous debates over the years, and mostly he is firmly in the ‘bad guy’ category on policy. For all that he is a nice guy and really, really knows the numbers and laws in play. Not least because he spent some time as the Principal Deputy Commissioner of Social Security (the no. 2) during the Bush Administration. With that as background Biggs told me that the situation at Trust Fund Depletion was not as clear-cut as almost everyone assumed and had been the topic of some high end discussion at SSA. And their conclusion as related by Biggs to me mirrored that of the Congressional Research Service in this Report from last year. 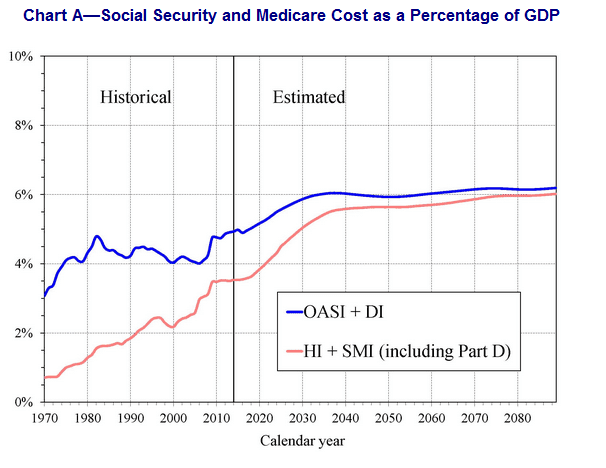 The Social Security Trustees project that, under their intermediate assumptions and under current law, the Disability Insurance (DI) trust fund will become exhausted in 2016 and the Old-Age and Survivors Insurance (OASI) trust fund will become exhausted in 2034. Although the two funds are legally separate, they are often considered in combination. The trustees project that the combined Social Security trust funds will become exhausted in 2033. 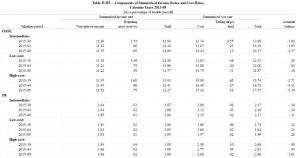 At that point, revenue would be sufficient to pay only about 77% of scheduled benefits. Social Security Administration (SSA) would not have legal authority to pay full Social Security benefits on time. schedule; another would be to make timely but reduced payments. Social Security beneficiaries would remain legally entitled to full, timely benefits and could take legal action to claim the balance of their benefits. The Report proceeds to outline the possible responses and is interesting for that alone. More important for my purposes though is the suggestion that the “conflict between two federal laws” precludes the option of Congress just sitting back and letting “automatic” cuts happen. Because as Biggs some years back and CRS last year point out, there is nothing automatic about this at all. I should have another post up with these same links prior to Report Release. But anyone who wants to bookmark the URLs and try to get a jump on just about everyone else in the country should feel free.